Don’t know how to describe the experience we made in Brighton’s Basement at Cybersonica and Future of Sound‘s week-long AV Lab so all I’ll say is I think I turned a corner creatively and technically, and I know I was in the company of some incredibly talented experimental AV artists. Here they are. Sabine Vogel – Sabine went from performing with an electronically-modified flute and footpedals at the start of the week to flute, effects pedals, a Wii-mote strapped to each forearm, Gypsy MIDI (exoskeletal metal arms that parlay the user’s movements as MIDI data to a trigger), laptop and 3D soundsystem by the last night. Unmissable. Gavin Morris – Gavin’s dry humour had us in tears regularly over the week. Another modest genius, his boredbrand site gives you an idea of the sort of mischievous crackpot schemes he cooks up in his digital bistro like it was a cheese toastie. Alison Ballard – Ali‘s major interest is infrasonics, and the physical effects of sound and resonance. In the final show she created a tone inside our heads, using the resonance of our ear canals. Shaun O’Connor – As VJ PrickImage Shaun is regularly sticking it to the East End club scene and touring with Bishi, when he’s not collaborating with me on MOTH (formerly FYI), which was the project we brought to the Lab for development. 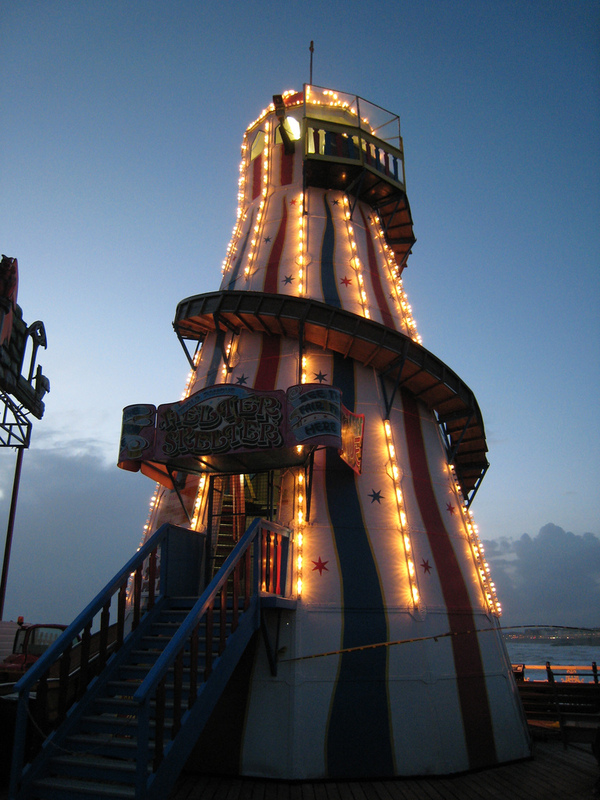 Simon Dell – Simon had the brilliant idea of getting 6 of us to ride a rollercoaster on Brighton Pier, equipped with sound recorders, while a seventh stood underneath capturing the doppler effect and ambient noise. This was then fed into Martyn’s 3D soundsystem and moved around you in realtime using a joystick. You just had to be there. Mike Blow – Another sound artist, Mike’s collaboration with Ali comprised some bizarre, insistent tones like a car alarm that (unbelievably) became completely riveting and affecting music. Ryan Jordan – A confident performer and funny bloke, Ryan’s collaboration with Shelley saw him pull tights over his head while strapped into the Gypsy MIDI for a mechanoid bankrobber musical mash-up in 3D immersive sound. Sonia Vera – OddScene and MOTH collaborated on an outdoor installation on the streets of Brighton. And up the walls. Her VJing and animated characters blend clever cut-ups with a gritty, flaky, scratched texture and tinted b&W silent films. Kristi Markiewicz – you’ve got to check out Kristi’s beats. She mixes her husky vocals live using a Korg pad and has been DJing for years. We worked on a live AV proposal which we’d like to realise ASAP, mixing her musical talents with video graffiti by the MOTH. Agnese Mosconi – Agnese’s programming skills provided a sensational responsive backdrop to Sabine’s flautism (?) on the final night. Her work deals in visual, non-verbal communication and exchange of knowledge. Barry Murphy – Barry’s impressive skills as a director, animator and filmmaker were evident from the work he presented. You’d never know cause he’s so quiet but check out his MA piece and cry because you didn’t make it. Shelley Parker – just listen to this. Shelley’s record label Structure is putting out phenomenal minimal sounds, italo-house and squeaky blip-bloop-bleep brilliance. She’s a truly original composer and performer based in West London. Jules Rawlinson – another innovative musician, Jules gave a fascinating demo with his monomé, a handmade device about the size of a mac mini which does incredible things with programmed and sequenced music. He also performed a milk crate remix in an alley – see drunkphdstudentsmakethefunniestmusic.com for details. Evan Raskob – Evan joined the workshop as a mentor/guest speaker and shared his knowledge of programming, sensors, and AVJing, as well as his Wiimotes, Arduino and several handwritten programs. He also showed me how to VJ in VDMX using Wiimotes (two of those in the post as we speak…). I’ll be performing at his Immersion night for the second time on Dec 4th. Steve Symons (from the Owl project) – showed off his iLog handmade instruments; wooden blocks with contact mics secreted inside them. He makes live music with these by sawing into them, wrapping tape around them and tearing it off slow, tapping and chafing them, and also makes music from olde-timey lathes (the string-and-springy-branch kind you see at Glastonbury etc). Martyn Ware – Martyn was a founding member of the Human League and Heaven 17, and now creates innovative three-dimensional sound installations with Illustrious and promotes new experimental musicmaking techniques through his Future of Sound events. Tom Belton – Martyn’s engineer and a sound bloke, Tom is also a composer and producer with SharpNine music, based in South London. Sarah Littman – Sarah is a filmmaker who gave us a screening of Boys With Lightsabers, a documentary about some Welsh teenage chancers who’ve set up a church for the Jedi faith, which became recognised as an, um, serious religion after the results of the 2001 census. Matt – as half of I Am The Mighty Jungulator, Matt uses Max MSP patches and programmes to remix sound live into amazing jungle and dnb performances with motion-collage visuals, all semi-automated and partly coded live. Bruno Mathez – Bruno is a talented filmmaker, editor and VJ. He spent the week filming, plugging things in, and making an inspired abstract installation for the loft space of the beautiful Grade 1 listed De La Warr Pavilion at Bexhill-on-Sea which I hope to see again on the 22nd of November. Ray Lee – inspirational sound environment artist. Ray took some time to isolate and attune us to the sounds we could hear all the time, and his presentations on previous work opened our eyes to his Heath Robinson-referencing, War-of-the-Worlds-in-Notre-Dame-dramatic and forgotten visions of the future of music. Lewis Sykes – a member of The Sancho Plan and a dedicated promoter, funder and creator of creative new AV experiences, Cybersonica‘s founder has been running events since 2002, giving promising experimental artworks a forum to perform and collaborate. I’ve no doubt that some great collaborative works will come out of the network of common interest that is continuing to grow after this year’s Lab. Moth will be launching at Fabric on Sunday December 7th. This entry was posted on November 16, 2008 at 4:19 pm and filed under LAB,MOTH,software,technology,WORKSHOP. You can follow any responses to this entry through the RSS feed.